Detached house with 2 bedrooms and 2 bathrooms in a charming hamlet. 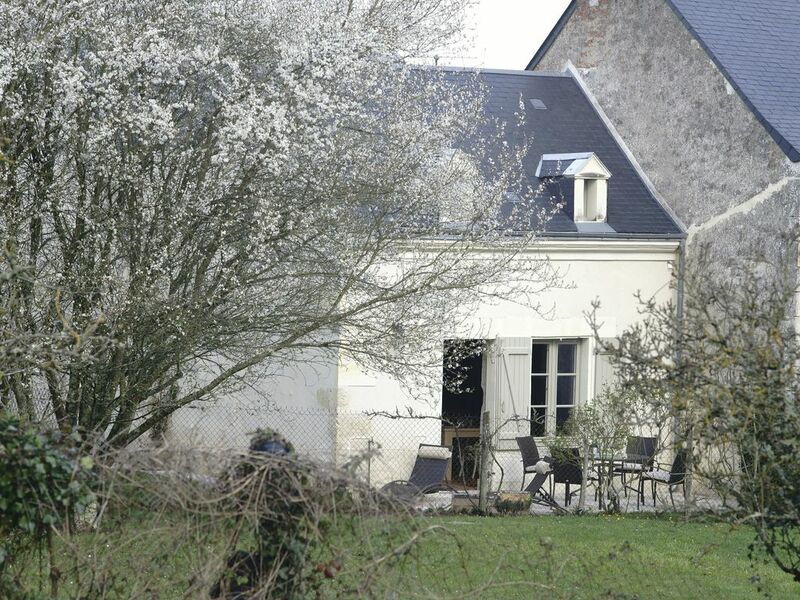 Located in the Regional Natural Park Loire-Anjou, between Tours and Chinon, 5 km from Azay-le-Rideau and 12 km of Langeais, between the forest of Chinon and the Indre valley, our house is a rural house independent of 80 m2 on closed ground. Passionate about nature or cultural outings, its location will delight you. - 1 bed 180 x 200 label "Beautiful bedding"
- 2 beds of 90 x 200 label "Beautiful bedding"
Bed linen, towels provided (beds made on arrival). A perfect haven, yet close to chateaux and shops! We spent a wonderful week with our grandson in this lovely house. Everything you need is here and is impeccably well-kept. There are excellent beds and bedding, providing restful nights in a very peaceful, but not isolated environment. The owners are charming and generous and there is no extra charge for firewood if you visit in winter. The table-tennis in the garden was great fun. There is plenty to do and see in the area, whether you are interested in history, activities such as cycling or gastronomy. Tours is a beautiful city and there are plenty of very attractive smaller towns nearby. We would love to return! We had a great time welcoming you Anna and Peter. And Leo, who is perfectly bilingual, helped us a lot! We thank you for you took great care of our cottage, your kindness and your unwavering humor. If you feel like it, we will be delighted to welcome you again! We stayed in the L'Abeille bleue for 4 nights in October and had a really lovely autumn break in the beautiful Loire. The gite is very comfortable with a cosy log burner and central heating which means that you can be warm and snug throughout the year here, so it works for summer and winter breaks. Our hosts Didier and Patricia were warm and welcoming and made the stay even more special with their attention and hospitality. Th location is superb for easy access to lots of beautiful local towns and chateaus, and Azay - le - Rideaux is within walking distance, maybe 45 minutes along the river Indre, and is a great place to have on your doorstep. It is only 8 minutes or so by car. we would highly recommend this gite and the area for either shorter breaks or longer stays, it can accommodate both very well. We are very happy to have met you and to know that we will be able to see each other again. The blue Bee has been little rented in autumn or winter. And we are delighted to read your comments on the heating of our holiday cottage. If the Blue Bee brings comfort to its guests, they do it well by taking care of it! And you did it so well! Thank you very much and see you soon. This is certainly a home away from home. A very comfortable and cozy house with everything you need. The rooms are spacious, the bed very comfortable, the kitchen and dining room very cozy, including a nice fireplace. We enjoyed every minute here and certainly would recommend it to anyone. The house is very lovingly renovated with lots of beautiful features. There is also a large garden with a table tennis and lots of places to lounge around and relax. The hosts are very welcoming and gave us homemade treats. There are also neighbors who helped us when needed. There is plenty of space for 4 people with two bathrooms and toilets. We will come back if travel allows us. Thanks so much for a great stay, Didier and Patricia! Your stay in Touraine has been too short for us and we've been so far during a part of it. We hope that Neil has now a good health and that your stay in Paris gives you everything you were waiting for. Thank you a lot for your great care of Blue Bee. We would enjoy seeing you again! The house was very nice and had everything necessary to ensure our comfort. We were lucky with wonderful weather so were able to enjoy the patio,wood-fired grill and loungers. While located in the countryside it was very convenient to major sites like Chateau de Villandry. Take note of Didier’s wonderful photos of local places and notice where they were taken while you travel about. Dicier and Patricia were wonderful hosts who gave us a local bottle of wine as well as their own apple juice and Patricia’s mirabelle preserves when we arrived. We really enjoyed our stay and wished we could have stayed longer. Abigail and Thomas are charming hosts, delicate and attentive. We spent with them very good times during which they showed a great indulgence for our English. Thomas is a virtuoso of the cooking and an outstanding butler! Thank you both for your kindness that touched us a lot. L'abeille bleue is a wonderful house, beautifully equipped and tastefully decorated and furnished. The house is spacious for 4 people and has two superb bathrooms, large kitchen, beautiful bedrooms and even a living room too. The terrace area and garden right outside the kitchen are lovely and a real sun-trap. Didier and Patricia are very warm and welcoming hosts, and are on hand if there is anything you need at all during your visit. Nothing is too much trouble, if needed. They are discreet hosts, also. Situated in a little hamlet, the location is very tranquil and restful. You can reach the town of Azay le Rideau in just a few minutes, as well as many places along the Indre river, and the Loire, Cher and Vienne rivers. Especially enjoyed visiting the Chateau d'Islette where you can hire a small rowing boat on the Indre. Further afield, Tours, Amboise are within easy reach. L'abeille bleue is a perfect place to stay, and we would not hesitate to return. It is also an excellent base for exploring the area. Merci à Didier et Patricia. We had great pleasure to welcome you to the Blue Bee. And we regretted that your stay was shortened. You are right, our region is very beautiful and the cottage ideally placed to visit castles, meet winegrowers or to walk, simply. We thank you very much for your kindness and the care taken in the cottage. Myself and my Husband Fiachra stayed in the Blue Bee for 1 week in September and we recommend this to the highest degree. Our hosts Didier & Patricia were great, they gave us a warm welcome and were so friendly and generous throughout our stay. If we needed anything they were always ready to help. The house itself was wonderful, full of character and style- so clean and well stocked with all the amenities you need for a great stay. The garden was fantastic - we picked figs and apples for breakfast each morning and Patricia & Didier shared vegetables from their garden with us. Not to mention some great games of table tennis! Our experience here was far superior to that of AIRBNB. Thank you both - we really enjoyed our stay in the Blue Bee. As we didn't get time to see all the amazing sites of the Loire Valley we will be back soon. We thank you very much for your compliments, they touch us very much. We also enjoyed welcoming you, it's so easy both, you are charming. Congratulations for enjoying our beautiful Loire Valley, garden and sun during your stay! We'll be very happy to see you again.